Christiana Brinton (CB): Hello Mark. Thanks for talking with me today. Can you summarize your professional background for our readers? Mark Milligan (MM): Hi Christiana, sure. From 1996-2011, I was Pastor of the Zion UCC in Florissant, MO, and then moved to Vermont where I became the Pastor of the South Congregational Church (UCC) in St. Johnsbury until March of last year. Currently I am Pastor of St. Peter’s UCC, Frankfort, IL. My wife, Mary and I are very happy to be back in the Midwest where we’re both from originally. 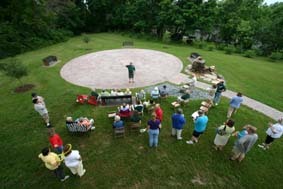 CB: Zion UCC has a beautiful,medieval Chartres style paver labyrinth in a garden on church property that you helped birth. Can you tell us what this process was like? MM: There are often misconceptions about church labyrinths; those who aren’t religiously inclined hesitate to walk labyrinths in churches or on church grounds for fear they will be forced to adhere to strict guidelines or dogmatic regulations, while more conservative churchgoers still view labyrinths as new-agey, pagan, and cultish. This is the attitude I understood I was dealing with at the outset, but UCC is a fairly progressive church organization. So I simply contacted our conference office, wrote an article about labyrinths for our own national eNews, and then started creating events using temporary labyrinths. CB: Were these events open to the public? MM: Our temporary labyrinths were mostly painted on the parking lot or cut into the grass, and were always open to the public. Once enough of our congregation saw the value of this contemplative form, and experienced the difference it made in their own lives, they took the ball and ran with it. An outdoor site was approved, donors came forward, Robert Ferré was hired to design the permanent labyrinth, and Marty Kermeen to build it. 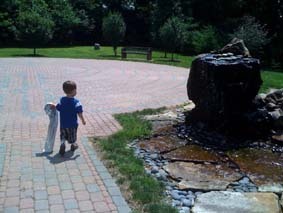 We now have a waterfall feature within the garden area too, so walkers have the soothing sound of water to walk with, as well. And it’s open 24/7 for anyone to walk, anytime. CB: So once it was dedicated in 2005, how did you encourage further participation? MM: I started a statewide labyrinth network to provide opportunities for clergy of other congregations to come and experience the labyrinth as a useful addition to a parish’s outreach, community building, and pastoral care services. 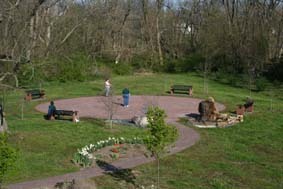 This network allowed other community organizations access to our labyrinth as well. We hosted senior citizen and day care center groups, students from the psychology departments of local colleges and universities, and groups of student nurses from the local teaching hospitals who came to learn about spirituality in healthcare settings. CB: So it helps to have a pastor or minister who is enthusiastic, committed, and has experienced the value of labyrinths in his or her own life! MM: Yes of course, it is helpful, but it is vital that the community become involved as well. 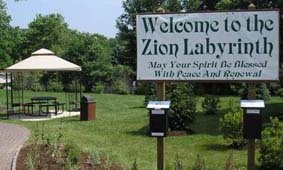 By the time I left Missouri, 15 churches were a part of our labyrinth network, and Zion UCC voted to add a labyrinth ministry to its by-laws, which really helps keep a labyrinth program and events continuing into the future. CB: So then what happened in Vermont? MM: I created a statewide labyrinth network there too, and we had five one-day labyrinth retreats for ministers and pastors of diverse denominations across the state. Methodist, Presbyterian, Episcopal, Catholic, Jewish, Buddhist, and other UCC parishes participated. We didn’t manage to get a permanent labyrinth installed while I was there, but the St. Johnsbury community is still working on it. 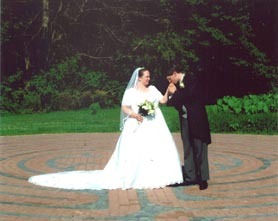 My wife, Mary, made a canvas labyrinth which we used for public walks during the Christian liturgical seasons, and these were always well attended. CB: So would you say that having a labyrinth program at these parishes increased church attendance? MM: If you mean paying church members, I don’t know if it really increased church attendance, but, in both locations, it certainly created a greater labyrinth community of regular walkers who deeply appreciate the scheduled walks and access to this contemplative form. CB: And now, Mark? Will you create another labyrinth network in Illinois? MM: I am working on it. It’s not something I can ignore—the value is too obvious to me. Once you see the difference labyrinths make, there’s no going back. CB: Thank you, Mark. It was a pleasure talking to you today! I think our readers will be very interested in your observations and experience.